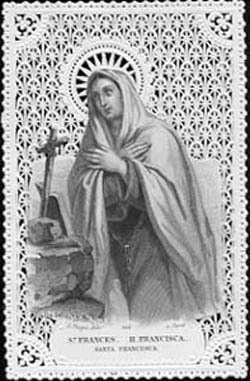 (Saint Francesca Romana; 1384 – March 9, 1440) was an Italian saint. She was born in Rome to wealthy parents. When she was eleven years old, she decided to be a nun, but within two years her parents married her off to Lorenzo Ponziani, commander of the papal troops of Rome. Although the marriage had been arranged, it was a happy one, lasting for forty years, partly because Lorenzo admired his wife and her sister, Vannozza, and partly because he was frequently away at war. The women prayed, visited the poor, and took care of the sick, inspiring other wealthy women to do the same. Francesca became widely known among the poor by the nickname “la Ceccolella”. Francesca and Lorenzo lost two of their six children to the plague. In their case, it sensitized them to the needs of the poor. The city of Rome was largely in ruins, wolves were known to enter the streets. During the wars between the legitimate pope and various antipopes, Lorenzo served the former. However, in his absence, much of his own property and possessions were destroyed. Eventually he would return, wounded, to Francesca’s care, dying in 1436. According to the Catholic Encyclopedia, “With her husband’s consent St. Frances practiced continence, and advanced in a life of contemplation. Her visions often assumed the form of drama enacted for her by heavenly personages. She had the gift of miracles and ecstasy, (as) well as the bodily vision of her guardian angel, had revelations concerning purgatory and hell, and foretold the ending of the Western Schism. She could read the secrets of consciences and detect plots of diabolical origin. She was remarkable for her humility and detachment, her obedience and patience”. St. Francesca had turned part of the family’s country estate into a hospital. On 15 August 1425, the feast of the Assumption, she founded the Olivetan Oblates of Mary, a confraternity of pious women, attached to the church of Santa Maria Nova in Rome, but neither cloistered nor bound by formal vows. In March 1433, she founded a convent for common life by the members of the group at Tor de’ Specchi, which remains the only house of the Order. On 4 July of that same year, they received the approval of Pope Eugene IV as a religious congregation of nuns. The community thus also became known as the Oblates of Saint Frances of Rome. When her husband died in 1436, she became the group’s superior. She died in 1440 and was buried in that church. On 9 May 1608 she was canonized by Pope Paul V, and in the following decades a diligent search was made for her remains. They were found on 2 April 1638 and reburied on 9 March 1649, which since then is her feast day. Again, in 1869, her body was exhumed and has since then been exposed to the veneration of the faithful in a crystal coffin. The church of Santa Maria Nova is usually now referred to as the church of Santa Francesca Romana. In 1925 Pope Pius XI declared her the patron saint of automobile drivers because of a legend that an angel used to light the road in front of her with a lantern when she travelled, keeping her safe from hazards.